"I really want to see this exhibition by a sculptor whose work I don't like." That's what I told my friend a few weeks ago before heading to the Ken Price retrospective at the Metropolitan Museum of Art. 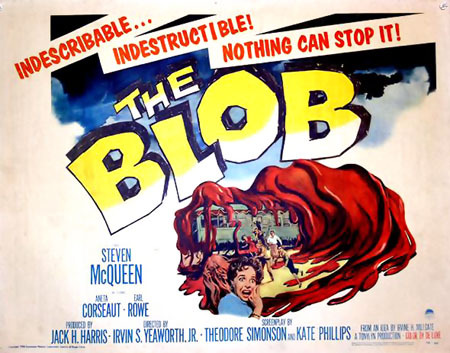 I'd seen several of his sculptures—globular, somewhat psychedelic, and (I always thought) reminiscent of "The Blob." Let's just say they were not my favorite. Courtesy From Blob to Blog. And so I posed the consummate challenge to the Met: What am I missing? Help me to appreciate this work. Skeptical, I walked into the show and took in the clean lines of the exhibition display designed by Frank Gehry, long-time friend of Ken Price. 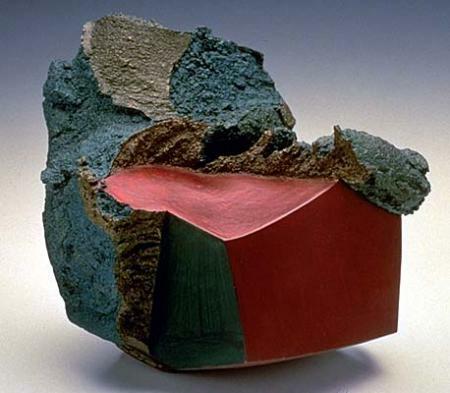 The sculptor's earlier works, like Chinese Block and Reltny (below), immediately arrested me. Reminiscent of geological specimens—an impression intensified by their wood and glass presentation cases—they featured subtly iridescent surfaces and a curious range of textures. I had then only to read that Price acted as a forerunner in liberating clay from the confines of craft and elevating it into the realm of non-utilitarian sculpture. Result? A relatively sudden understanding of Price's importance, and a new perspective in viewing his art. Met: 1, Sara's cynicism: 0. Chinese Block, 1984. Courtesy kenprice.com. Reltny, 1983. Courtesy Modern Art Notes. The first pieces on display drive home this transition from the functional to the purely aesthetic. On one side are ineffectual pots, with no holes to transmit their contents; opposite is an endlessly inventive array of "cups" (below). In the accompanying text, Price describes a cup as its own subject, one which need only be about itself. However, he notes it can also serve as a vehicle for ideas. With a "simple and utilitarian form," "a set of formal restrictions, and a preordained structure," it can nevertheless give rise to wildly creative works such as are seen here, complemented by wonderfully surprising colors. Blind Sea Turtle Cup, 1968. Courtesy NYT. And so we have the basis for Price's evolution as an artist. The next galleries showcase the wacky and vibrantly hued amorphous forms most frequently associated with his name, but first we see a spread of architectural pieces, and a delightful selection of works on paper making quite apparent the linkage between Price's earlier and later creations. "Gorgeous!" I scribbled in my notebook. His alien sculptures may well derive directly from the stylized shapes comprising his landscapes. 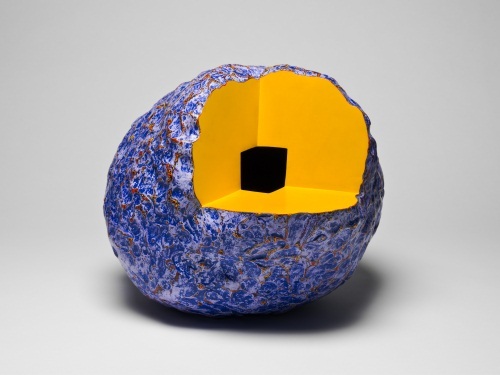 This missing link, so to speak, helped me to understand how Price's singular sculptures can at once embody the organic and the otherworldly, the terrestrial and and the extraterrestrial. 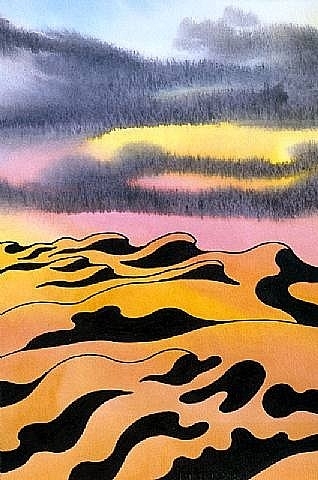 Deep in the Desert, 2005. Acrylic and ink on paper. 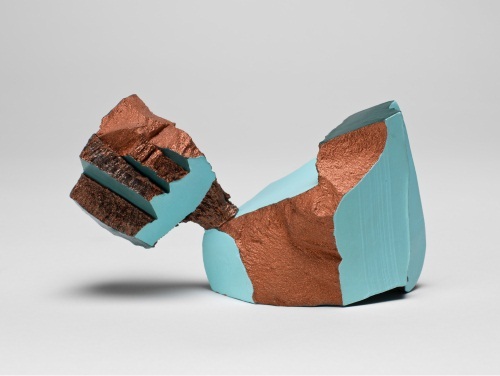 9 x 6 inches Courtesy Matthew Marks Gallery via Artnet. Close inspection of each piece reveals mesmerizing patterns of color, and a sophisticated iridescence that photographic reproductions fail to adequately replicate. Artist Robert Irwin is quoted on the wall declaring Price's use of color "so informative of the shape," and indeed the two are deeply interdependent. Price invented a particular process of layering as many as seventy layers of paint, which he then stripped away by sanding or rubbing with pigment-dissolving agents. The resultant combinations hypnotize the eye, rewarding closer inspection with ever-increasing complexity. Color becomes integral, serving not as decoration but representing an "organic fusion between the surface and the color." 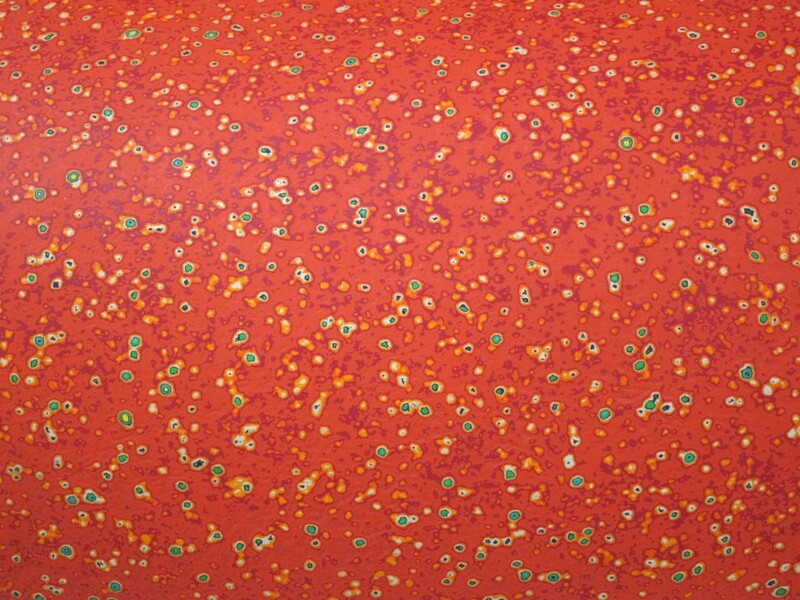 A detail of a work hardly does justice to Price's intricate surface treatments. Courtesy Accessible Art. Price engages viewers by other means as well, playing with dimensionality and perspective. Many of his pieces feature holes that are sometimes chasms and sometimes merely black paint. Discovering this I felt I had caught on to a game, and difficulty in discerning the difference created a pressing desire to touch. 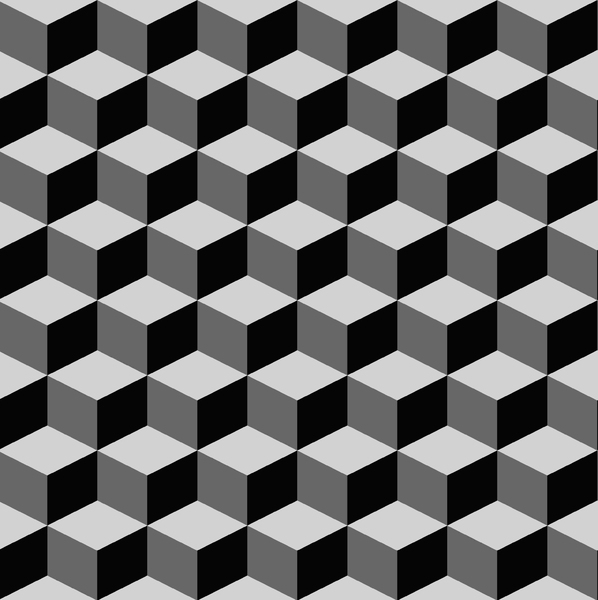 Looking longer only increases one's uncertainty—the dark areas begin to mimic the optical illusion where one can "flip" dimensionality, reading shapes as either recesses or projections. Big Load, 1988. Courtesy Modern Art Notes. 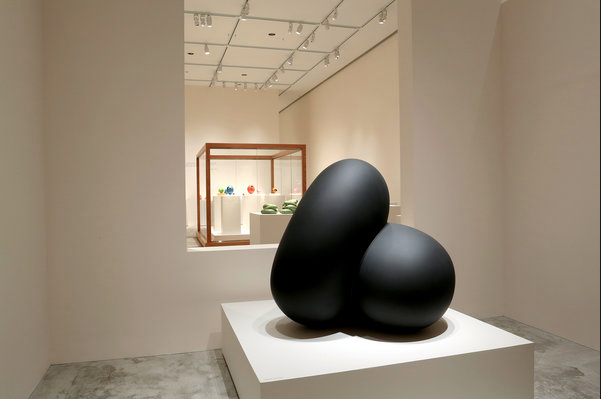 The insistent forms Price created made me wish they were displayed on higher pedestals, the better to admire the fluidity of their lower surfaces. 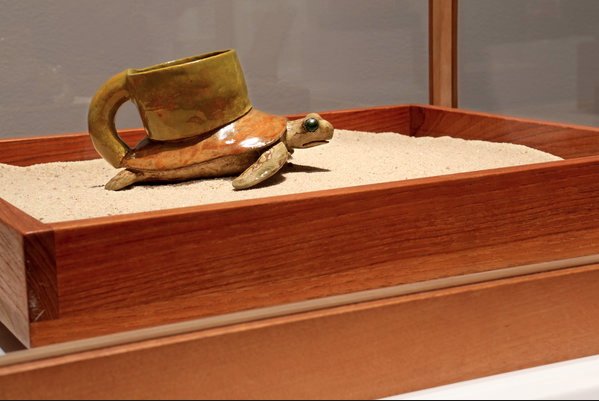 Other aspects of the exhibition design I found quite appealing, including the aforementioned boxes à la Joseph Cornell, referencing this artist's 1962 exhibition at the Ferus Gallery (an installation shot of which is happily included on a label among Price's earlier works). The cutout in the wall behind a monumental work entitled Ordell mirrors these rectangular shapes (below), as well as the "holes" featured in many of the sculptures. Ordell, 2012. Courtesy of NYT. Whether intentional or not, the rugged texture of the floors mirrors that of several of the works' surfaces. I had difficulties, however, with the placement of some object labels, especially those pertaining to works grouped together in display cases. Their location was not at all intuitive, to my mind, and—because they were not always in proximity to the works described—they required one to twist and turn to compare information with the actual pieces. I also felt the lack of labels and text for the pieces on display outside the official entrance of the exhibition—and it was not until I exited that I realized I had progressed through the show in reverse. My path seemed to me to make conceptual sense, but the doorway I entered featured none of the explanatory text or pictures found at the opposite end. Arctic, 1998. Courtesy of Modern Art Notes. "Don't you want to touch it??" 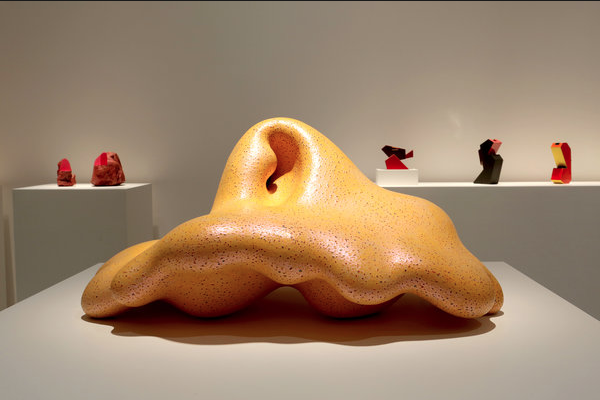 Ken Price Sculpture: A Retrospective was organized by the Los Angeles County Museum of Art, and is on view at the Metropolitan Museum of Art through September 22, 2013. Located on 5th Avenue, the museum's main entrance is at 82nd Street. Hours are 9:30am-5:30pm Tues-Thurs and Sun., 9:30-9:00pm Friday and Saturday. On July 1st the Met will be open 7 days a week, with Monday hours 9:30am-5:30pm. Museum admission is always pay what you wish; suggested prices are $25 for adults, $17 for seniors (65+), $12 for students. Free for members and children under 12. Ken Price: Slow and Steady Wins the Race, Works on Paper 1962-2010 ran through Aug. 18 at the Drawing Center, 35 Wooster Street, SoHo; (212) 219-2166, drawingcenter.org. It appears at the Albright-Knox Art Gallery in Buffalo from Sept. 27 to May 4, 2014 and travels to the Harwood Museum of Art in Taos, N. M., from Feb. 22 through May 4.